This site was started by a family therapist and an engineer / client based in Scotland. Our shared case work grew into a wider collaboration about patterns in high conflict separated families. We see children’s needs ignored while adults in families and professions and academia took gender-based sides. Equalism, we believe, helps cut down that fuelling of fires. Here we try to separate our own partial positions, motives and agendas from the wider diverse vision of which our local views are part. We hope we have created a protected and equalist space on this site for all the -isms and viewpoints. 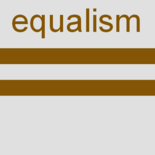 Equalism and equalism.org.uk propose a simple but hugely diverse vision. There is no way a few amateurs can support that vision practically or academically. Apologies for all the limitations on the thinking here, and that this is only one step towards that huge vision happening. Any offers to help the project are welcome. One thing’s for sure: equalism.org.uk will always be a work in progress. All Minus One: Going viral for 160 years!